There was quick reaction to President Donald Trump's announcement last week that he plans to follow through on his campaign pledge to build a wall on the U.S.-Mexican border. Conservative and liberal commentators alike were channeling their inner Robert Frost, referencing his poem "Mending Walls" that starts "Something there is that doesn't love a wall" and contains the well-known proverb, "Good fences make good neighbors." It is worth remembering that this border is an imaginary line we draw ourselves. It's true that the Rio Grande separates Texas and Mexico. But much of the rest of the border is dirt. 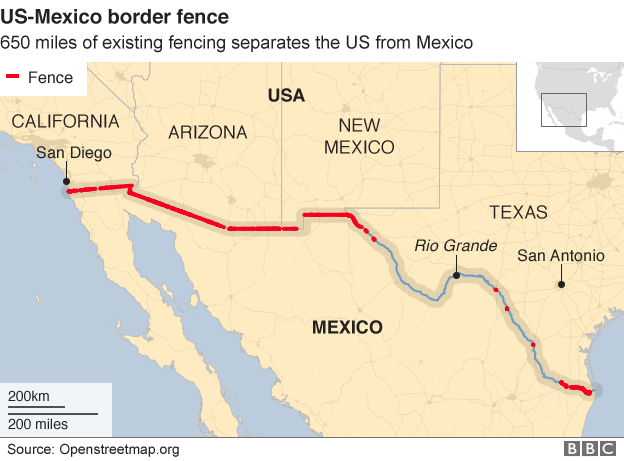 The only way to see the border is to draw a line. Animals don't really respect borders the way we'd like them to. The jaguars, gray wolves and ocelots which depend on ranges that cross the U.S.-Mexican border don't see it.Humans can detect the human signs of a border. But they tend to think about how to get across it rather than how to stay on one side. Even East Berliners in the days of the famously lethal Berlin Wall found ways to get across to West Berlin. They went up, around, under and through it again and again. I am reminded of my days in South Texas when the federal government decided enough was enough and erected a floating border of sorts around Florida to stop rising seaborne drug trafficking. As a result much of that drug trafficking merely shifted westward, some of it to the Texas coast. Humans are making a mockery of the current border barrier daily by simply walking or driving through regular border crossings. It's hard to see how that will change with a wall. The wall will have to allow for current bridges and land crossings. And, it will have to allow rivers on the American side to flow into the Rio Grande or out of and into Mexico where it touches the Colorado River basin. As for the current barrier, people can just climb over it or through it where there are holes made by wire cutters. Yes, yes, I know. This new wall will be concrete, and it will be 55 feet tall, according to Trump. I'm sure in Trumpian language the wall will be fabulous and the best wall ever built by the smartest engineers. It will be "beautiful," he says. We have no actual plans or specifications for such a wall from the Trump administration yet. But, a fanciful attempt by a Mexican architectural firm imagined a pink wall (so it would be beautiful) stretching from the Pacific Ocean to the Gulf of Mexico. The architects estimated it would take 16 years to complete in part because the mountainous terrain along some of the border will be difficult to access and build on. Perhaps adding to the difficulty for this design will be the shopping malls and detention centers built right into the wall. Still, unless the wall is attended to by guards all along its length, people will just find ways over it or possibly under it. Ladders are pretty handy. Of course, wire cutters may also be needed. Where there is water, boats are a good choice and can be navigated up the tributaries of the Rio Grande well beyond the wall. Those crossing the border have a lot of experience with all of these. It's hard to imagine that at one time the United States had a formal agreement with Mexico called the Bracero Program to import Mexican laborers to overcome a labor shortage, primarily for seasonal agricultural work during World War II. The program lasted until 1965 when new immigration legislation ended it. The need for Mexican seasonal labor, however, didn't end which is why much of the movement of 500,000 Mexican workers in and out of the United States each year continued as that movement went from being legally sanctioned and administered to being illegal. Given all the goods and people crossing the Mexican border every day, the hoopla over the proposed wall must actually be about something other than keeping goods and people on the Mexican side out. It's more about the lines we construct in our minds between us and others. Denizens of the U.S. coastal regions are used to the cacophony of voices and subcultures that populate their daily lives. There is no convenient line that can be drawn to separate cultures from one another in those places. In so-called flyover country, where Trump was hugely popular, recent immigrants are more sparse. It is easier to draw a line between "us" and "them." By this I do not mean that people living in the Plains states or the Midwest are not charitable. One can find plenty of stories about kindness to newcomers from foreign lands. But the newcomers do not simply melt into a polyglot culture in those places. They are aliens and remain so for a very long time after arrival. The wall--whether it is ever built or not--signifies a desire to reduce the number of newcomers and to preserve a way of life that is threatened economically and culturally by the globalism embraced by the country's bi-coastal elites. Stop the invasion of newcomers and you will stop the forces bearing down on a threatened way of life in flyover country; so goes the visceral logic. It's doubtful that such a wall can do either. But a promise to build one signifies sympathy for a certain fearful and nostalgic outlook and an opposition to a globalism that has devastated the economies of small towns and rural communities--by shipping manufacturing jobs overseas and by favoring the consolidation of agricultural in a way that is driving more and more people off the land. Sometimes when we put up barriers to others, it can actually be to draw them nearer in steps. Lovers love the chase. Businesspeople stake out negotiating positions, but do so only as part of a game to come to an agreement. Lines are drawn to be crossed. That's how new friends and new opportunities enter our lives. Sometimes we put up barriers to protect ourselves from others who might harm us physically or who might merely reject us or shame us publicly for sport. Sometimes, we put up barriers to those who are culturally alien, too, not because we necessarily dislike them, but oftentimes because we are not certain of the stability of our own cultural lives. The maelstrom of change which is now sweeping over American culture (and much of the world) can overwhelm those without secure anchorage. We are beyond the relative stability that prevailed prior to the 2008 financial crisis and into an in-between period of rapidly changing technological, social, economic and environmental forces, all of which demand new arrangements. The globalism that promised to put to rest old divisions has instead reawakened them. A retreat behind a wall won't reconcile those divisions. But neither will a rapid advance toward a socially untenable and ecologically disastrous globalism based on a neoliberal economic ideology that has led to financial stagnation and decline among so many low- and middle-income families. Economics thought that it could replace politics. Politics has come back to reassert itself and challenge what could not be publicly challenged before. The repressed always returns, often in ways which surprise and distress us. We now have no choice. We are obliged to cross lines into uncharted territory to discover a new politics and a new economics. There will be many barriers and detours, and it won't be an easy journey.